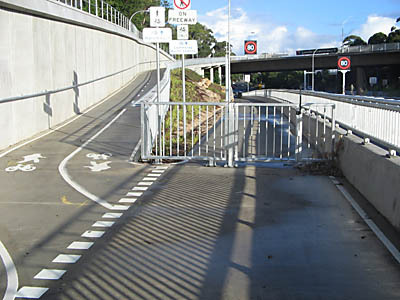 For those who cycle the Warringah Freeway, it is best to exit at the Naremburn Shops as they road shoulder through Naremburn is far too narrow. You can continue along Willoughby Rd or join the LCT path at Naremburn Shops. For those cycling the West St local route you are best to join the path at Naremburn at either Naremburn Shops or Bicentennial Reserve pathway. Its not worth going out of your way to join at Merremburn Ave. The road route is faster and more direct but you need to be comfortable with riding fairly busy Willoughby Rd with no bike lane. Exit the West St local route by a left turn into Burlington St and then right into Willoughby Rd. Continue along Willoughby Rd and join the LCT path at Naremburn Shops. This is the longer route, which uses the local bike paths through Bicentennial Reserve, sharing with pedestrians. Continue on the West St local route to and through Bicentennial Reserve and join the LCT path just after exiting the reserve west of the underpass of Willoughby Rd. If you are fanatic about the distance you ride as measured by your bike's odometer, here is a way to set it up very accurately. Place a mark on a flat piece of road, get on the bike and have someone slowly push you for five wheel revolutions. Start and stop when the tyre valve is straight down. Place another mark on the road where you stop. Then go back to the start mark and repeat. Do this five times. It is important minimise wobbling and to keep as straight as possible when being pushed. Then get out a long steel tape and measure the five distances. Throw out the longest and shortest marks. Average the remaining three. Divide the average by 5 to get the wheel circumference. 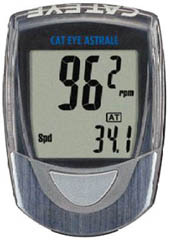 That will give you a very accurate number to enter into the bike computer as a calibration number. After doing this I found that my GPS and odometer agreed with amazing precision. Our neighbours also now have irrefutable evidence that we are quite mad!